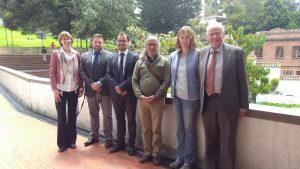 On the 23th October the representatives of the Colombian-German Peace Institute – CAPAZ held a meeting in Bogotá with Tom Koenigs, commissioner of the German government for the peace process in Colombia. CAPAZ was represented by the director of the consortium in Colombia, Prof. Dr. Camilo Borrero (Universidad Nacional de Colombia); Dr. Carlos Nupia, manager of the CAPAZ Institute; Prof. Dr. Angelika Rettberg (Universidad de Los Andes); Carolina Cerón, administrative and financial coordinator, and Claudia Maya, assistant for communications and public relations. The meeting was also attended by Mrs. Bettina Beywl, representing the German Federal Foreign Office and Mr. Ferdinand Jerich, of the German Embassy in Bogota. 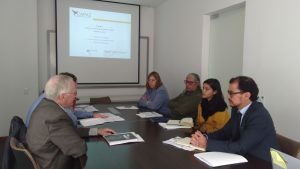 Tom Koenigs was very satisfied with the institute’s activities and progress, that were presented by Dr. Carlos Nupia, who reported about the development of CAPAZ’s projects, summer/winter schools and workshops. The commissioner emphasized the importance of the commitment of CAPAZ to promote research cooperation between German and Colombian universities. Koenigs underlined the significance of the assistance in the context of the peace process in Colombia that should be political as well as academic. In this sense, Koenigs emphasized the role of peace institutes around the world, acting as knowledge entities that catalyze cooperation between countries. In the Colombian case, cooperation with Germany must be reciprocal, with an emphasis on human capital. “Colombian students in Germany are a source of inspiration. Cooperation between the two countries must be at the same level”, said Koenigs. The challenge is to identify how to make the peace process in Colombia sustainable and permanent. “The idea is to promote continuity, sustainability in long-term partnerships”, said the German delegate.